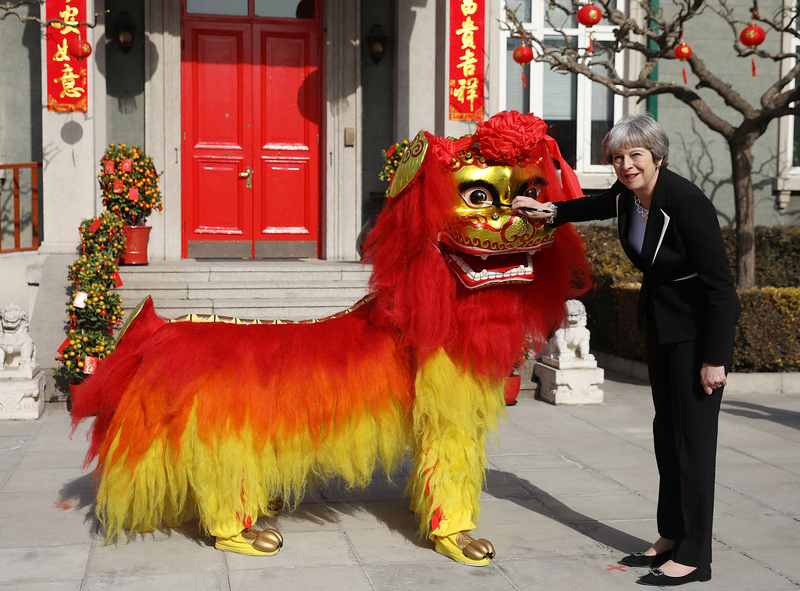 British Prime Minister Theresa May ‘dots the eyes’ of a Dragon outside the British Embassy in Beijing, February 1, 2018. The Chinese idiom ‘paint the dragon, dot the eyes’ is used to describe a small finishing touch added to something to make it perfect. British Prime Minister Theresa May went to China at a time when her country faces an uncertain economic future. The U.K. voted to leave the EU in June 2016, and the British Parliament has just started to examine the Withdrawal Bill that will prepare the official exit, set for March 29, 2019. An internal report has been leaked showing that the British economy will be hurt after 2019 no matter how well the Brexit negotiations with Brussels will go. If the U.K. is going to lose its biggest trade market, it badly needs new opportunities, and London believes that China is a good bet. Before the Brexit referendum, May’s predecessor David Cameron also thought that building commercial ties with China should be a priority, and that a “golden era” of bilateral relationships could be ushered in, as he cooed to Xi Jinping during his visit to London in 2015. Back then, as today, no discussion about enhanced bilateral relations with China happened without the Belt and Road Initiative looming large. The actual “golden fruits” reaped from closer ties with Beijing for U.K. businesses remain to be seen, but Cameron’s personal dedication to Belt and Road’s success seems to be genuine. He has recently agreed to take a leadership role in a U.S.$1 billion investment fund set up to support the initiative. Beijing has been relentless in its efforts to present Belt and Road to the outside world as an inclusive, “win-win” affair that will help bring economic development to a large region mostly composed of emerging and developing countries, stretching from China’s eastern shores all the way to Western Europe. Foreign companies have pondered whether and how they could get a slice of the pie, only to discover that Chinese companies are overwhelmingly eating it, leaving only crumbs to other players. Beyond concerns about Belt and Road’s impact on recipient countries’ debt burden, social and environmental standards, lack of transparency, and corruption of local elites, the problem is that BRI is not exactly what the official narrative, repeated by Chinese state media and diplomats, says it is. It is not just about building new railways and ports, but about increasing Beijing’s political influence over the region and shaping it in a way that benefits Chinese interests, both economic and geostrategic. What is at stake is nothing less than the dawn of a world order completely different from the one that has prevailed since 1945 and has rested on shared standards, norms, and values such as individual freedom, political equality, democratic self-government, and the rule of law. The Chinese regime is now, more than ever before, confident enough to present China’s own path as “a new option for other countries and nations who want to speed up their development while preserving their independence.” By refusing to officially endorse Belt and Road other than through a simple acknowledgment that it exists, May stands firm on the principles that underpin a vision of the world that is different from Beijing’s. At a time when global leaders, disheartened by Washington’s behavior, are increasingly pinning their hopes on China to lead the way, her decision is commendable. Other democratic leaders should follow suit. In the end, British Prime Minister Theresa May gave a much more positive response to the Belt and Road Initiative than the pre-visit press reports suggested. Speaking in Beijing, she welcomed the initiative as offering opportunities “to further prosperity and sustainable development across Asia and the wider world.” Echoing language previously used by British and Chinese officials, she called the U.K. a “natural partner” for the initiative, and highlighted continued discussions on cooperation under the initiative. This aligns with the positive response to Belt and Road from British businesses, many of whom have seen it as a platform for commercial cooperation with Chinese companies. This response points to the way that the Belt and Road Initiative is ultimately about what China’s counterparts make of it, and that the developmental ideologies which underpin it—in particular infrastructure investment and enhanced connectivity—are not that different from long-standing globally-dominant approaches. Seen this way, the Belt and Road is more likely to reproduce the existing structures of a capitalist globalization than to replace them with something different. What makes some uneasy, however, appears to be the prospect that China will continue to grow more influential and powerful in the global economy, and that the Belt and Road Initiative suggests a more proactive intensification of this by Beijing (though sometimes it seems that the main objection to Belt and Road is simply that it was proposed by the Chinese government). This trend is of course challenging for those who are accustomed to playing a dominant role and setting the agenda in global affairs. But how to deal with these changes in the global distribution of power is a bigger strategic question than responding to the Belt and Road per se. Change is going to happen; exactly how depends rather on whether we choose to manage it in a collaborative or confrontational way. A Chinese proverb says: “When the wind of change blows, some build walls, while others build windmills.” When it comes to China’s Belt and Road Initiative, Western democracies seem undecided about what to do. But as Tim Summers points out, British companies are not content to keep sitting on the fence as an imminent Brexit threatens economic setbacks. Why needlessly miss out on “golden era” business opportunities at a time when the former empire is in urgent need of alternatives to European markets? The Belt and Road predicament that Theresa May found herself in during her recent visit is perhaps best understood from a hospitality perspective. In Chinese and other Asian cultures, the host bears the greater responsibility. Guests are warmly received and lavished with extensive delicacies. At the same time, it is tacitly understood—though never openly articulated—that politeness requires a certain respectful acquiescence to the host’s setting. The host’s authority remains subtly in the background yet always present. By generously funding and financing infrastructure projects across the globe, Chinese “hospitality” is extending well beyond its borders. Some nations such as Sri Lanka are now at times guests in their own homes. These unarticulated host-guest dynamics are perhaps the reason behind Western hesitancies to openly join the Belt and Road Initiative. Just as the influence of host values on guests is an ambivalent and complex matter, the question whether Belt and Road is “anti-democratic” has no straightforward answer. In this context, Summers emphasizes the free will of the guests, arguing that Belt and Road is essentially a vehicle that empowers “guest” nations to further their existing pursuits. In contrast, Nadège Rolland warns that the very act of sitting down at the host’s dining table amounts to endorsing a thoroughly antithetical value set. Both have a point. However, things are complicated by the fact that hosts and guests are often not equal players. In contrast to May’s Britain, China appears strong and united. Threats of a “Tibexit” or “Xinjexit” at its volatile western frontier seem presently contained through unprecedented securitization and omnipresent surveillance as thousands of police are blanketing streets. A closer look in the host’s backyard, which is in fact the designated hub of the Belt and Road Initiative, reveals pre-emptive policing taken to the extreme. Entire segments of Xinjiang’s Uighur population are being interned in barbwire-clad political re-education camps, where some have already died. Theresa May knew about this, having received a related letter from a group of concerned academics prior to her visit, yet did not publicly raise the matter while in her host’s presence. Announcing Britain’s Belt and Road entry would then have signaled an abrogation of core democratic values. If Europe remains on the fence or builds walls, chances are it will gradually end up at the Belt and Road dinner table anyhow, joining bit by bit without ever developing unified strategies. May’s visit exemplifies how bilateral engagements may satisfy individual nations’ current economic needs but fail to shape the overall setting. Rather, the EU and the U.K. should jointly determine and negotiate conditions and expectations for joining the Belt and Road Initiative, and offer to host its next meeting. If other nations only ever get to look at Chinese “windmills,” why should they know or respect European values?